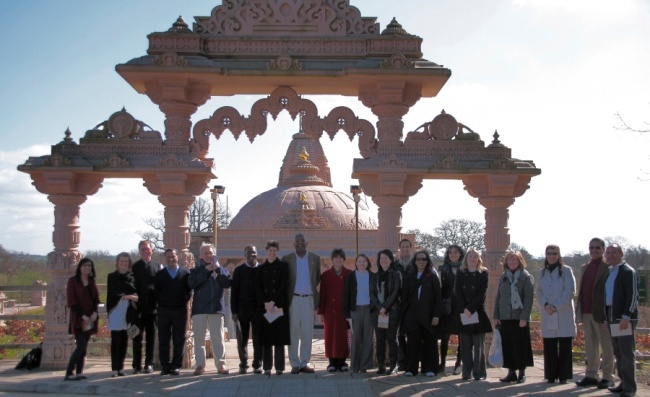 Photo: Leaders from Diverse Ethics client family visiting the outstanding Jain Temple and Culture Complex in North London, 2009. One of the most effective ways of learning about and really 'experiencing' diversity is by embarking on a live, guided, culture tour. This enables you to go into the hearts and minds of diverse people. Here at Diverse Ethics, we have been doing these for years, and the participants still remember them as huge eye-openers. And the beauty about living in Britain is that there are diverse community centres all over the country, even in small towns. We have taken our clients to a Sikh Gurudwara, a Mosque, a Multi-faith centre in London, a Jain temple and experience of a Jain festival, the most beautiful Hindu temple in Britain (dubbed as one of the greatest additions to British architecture by David Dimbleby). - you experience all aspects of the culture and faith e.g. at the Sikh gurdwara, we participate in the 'Langar' which is their open grace and hospitality to all visitors by inviting them to a freshly cooked vegetarian meal. And to wrap it all up, we have a discussion and question and answer session, and this is when the participants can relate the experience back to their own organisations and work challenges. So what are you waiting for - go on a culture tour, and open a whole new world of learning and creative wisdom.